Is it a tough job to create a pivot table? If you create your pivot table with Recommended PivotTables option, it is one of easiest jobs in Excel. New Feature: Recommended PivotTables is a new feature in Excel 2013. If your data is in a worksheet, select any cell within the data range and choose Insert ➪ Tables ➪ Recommended PivotTables, Excel will quickly scan your data and the Recommended PivotTables dialog box will appear. This dialog box will present you thumbnails of some pivot tables. You can choose your required one from these options. 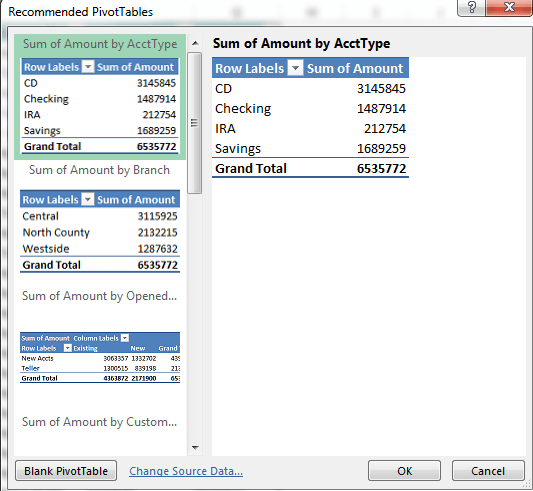 The following figure shows the Recommended PivotTables dialog box for our Bank-accounts.xlsx data. Recommended PivotTables dialog box. You can choose pivot tables from a list in this dialog box. The pivot table thumbnails use your actual data, and there’s a good chance that you will get one from the options what will serve your purpose or at least will be very close to your purpose. Select that thumbnail, click OK, and Excel will create the pivot table on a new worksheet. When you select any cell in a pivot table, Excel displays the PivotTable Fields task pane. You can use this task pane to change the layout of your pivot table. Note: Your data may have in an external database. To make a pivot table using this external database, select a blank cell of an existing worksheet. When you choose Insert ➪ Tables ➪ Recommended PivotTables, the Choose Data Source dialog box will appear. Select Use An External Data Source, and then click Choose Connection to specify the data source. You’ll now see the thumbnails of the list of recommended pivot tables. Choose one what serve your purpose. Choose a pivot table that’s close to your requirements, and then use the PivotTable Fields task pane to modify it. Click the Blank PivotTable button (at the bottom of the Recommended PivotTables dialog box) and create your pivot table manually. Formatting Excel Pivot Tables in 7 Ways!